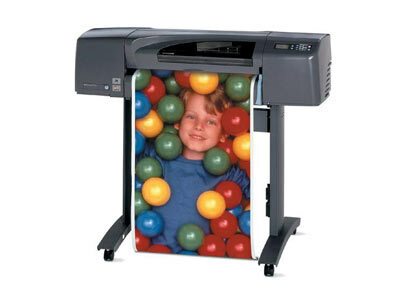 A large-format printer is large in size and can handle a wider range of media sizes: generally from 17 inches to 100 inches in width. In some cases, large rolls of paper are used rather than sheets, as these printers can continuously feed the media. Automatic or manual cutters will separate the printed page from the rest of the roll. Because of the wide and tall frame of large-format printers, consumers must first make sure they have ample space available. When installing, multiple people may be required to move the printer, as most weigh well over 100 pounds, and some are over 300 pounds. Many of the devices have a support frame which includes wheels, however, to make them easier to move once they are set up. While smaller consumer units exist, they are generally limited to a width of 17 inches. Most large-format printers use inkjet technology for printing, as laser technology is not well-suited to larger media. Another factor that differentiates large-format printers from typical consumer devices is the fact that they often use more colors, which increases the color accuracy of the output, but also results in higher replacement costs. The Canon PIXMA Pro9000 Mark II, for example, uses 8 different colors of PIXMA Pro9000 Mark II ink cartridges, which can really add up over several replacement cycles. For more on this issue, see Costs of Large Format Printers. With the ability to print posters, banners, and signage, as well as sketches or drafts for blueprints, the target audience is generally in the architecture, advertising or engineering field. Offices that do not want to go outside the company to handle oversized printing jobs may need a large-format printer, as will advertisers that make signs and banners, or engineers that need to supply contractors with blueprints and sketches. Overall, large-format printers may not be in huge demand by the majority of the world, and their bulky design and high price may be too much for average buyers. For the jobs they were built to handle, however, they are essential.